WHOO! It’s that time again! What time? Time to crown a new CUSTOMER OF THE WEEK! This week, we chose DAVID! David already had two frames from Eye Spy when he stopped in to check out some new styles. Lucky for him we had a gaggle of Theo Frames in the store and couldn’t wait to see him in these *amazing* blue (and brown!) Theos! Hey, waitaminute, where’s the brown? Well that’s the best part of this frame (okay, 2nd best, the best is how BLUE this Theo frame makes David’s eyes look!). The front of the frame is this lovely slate blue, but the top is chocolate brown! It’s always nice to find frames with personality. David also chose to wear with the Hoya ID lens, which is a progressive lens that gives the wearer a wider field of vision. So walking up stairs won’t make him feel like he’s inside of some carnival trick house. Now, in his new Theo frames, he’ll have a smooth look, aesthetically and functionally. Way to go David! You’re our CUSTOMER OF THE WEEK! Here at Eye Spy, we have a lot to be thankful for: awesome eyeglasses that surround us all day long, a funky and colorful work environment, and Dinkel’s right across the street! But, today, what we are most thankful for are the awesome awesome customers–you are all so much fun to have around! You make our hearts go ZING! What we are second most thankful for are the new frames that have been arriving all week! Theo’s classic metal style that we all know and looooove. And new Theo plastics! Absence does make the heart grow fonder! It’s been a while since Theo has made plastic frames and, yow, are we happy they’re back! Look at all the kids frames we’ll have in the store this weekend! Congratulations to Matt, our CUSTOMER OF THE WEEK! Matt has never been one to shy away from colorful or funky frames, recently he’s been sporting a really terrific pair of purple Anne et Valentin frames. When he came in to Eye Spy for a change of style, we knew the direction to turn in was RED! Awesome choice, Matt, these Theo frames look terrific on you! Whoo-Hoo! It’s time for our CUSTOMER OF THE WEEK! Let me tell you, this week, it’s a real stunner! Dewitt has *Great* taste in frames! He’s not afraid of wearing funky frames, whether it’s a yellow Anne et Valentin or these incredible blue Theo frames! This early bird got the way cool and totally awesome new Theo frame. When Dewitt came into the store, we had just received our new Theo stock, we hadn’t even put them out on the floor yet! But due to perfect timing, Dewitt was the first person to try this Theo frame on and he wasn’t about to let it go! Great choice, Dewitt, these Theo frames look amazing! Sad that summer is almost over? Don’t sweat it! There are still plenty of sunny days left! Eye Spy is celebrating these last days of summer with a Sunglass Sale! That’s right, we’ve putting almost all of our sunglass stock on sale! We’ve also ordered frames from three of our favorite designers, just for the month of August! 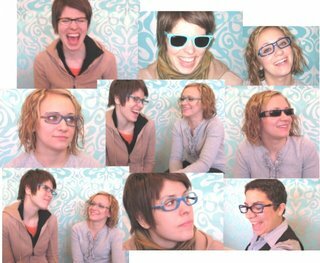 Come on in any time before August 31 and get yourself a snazzy new pair of sun specs for 10, 20, 50% off!!! This week, our CUSTOMER OF THE WEEK, is a familiar face ’round these parts. He may just be the father of our royal Queen of Specs. Does that make him the King of Eyewear? In these Theo frames, yes, yes it does. So let’s all stand and cheer for our CUSTOMER OF THE WEEK, Bob F.
Alissa chose these Theo frames especially for her dad, and wow does Bob look great! Lucky guy to have a daughter who can hook you up with Theo frames!